Frank Oz recently joined Twitter @TheFrankOzJam), and he’s a delight to follow. He’s also participated in his first Reddit AMA. I guess when he jumps into social media, he goes all the way! From providing the voices and puppeteering for characters such as Miss Piggy of The Muppets to Yoda from Star Wars, to directing feature films such as Little Shop of Horrors, Dirty Rotten Scoundrels, and the new documentary Muppet Guys Talking: Secrets Behind the Show the Whole World Watched — The man is a genius and a legend. Presented here are Star Wars-related highlights, plus a few I found particularly engaging. 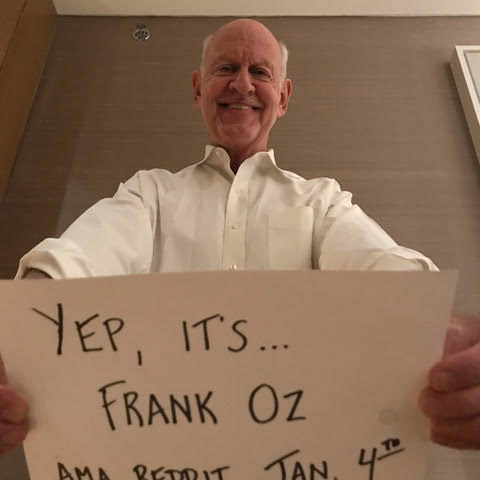 You can read the Reddit AMA with Frank Oz in its entirety here. Q – Hi Frank, i’m from Vancouver, BC. Just wondering what it was like to come back to the Star Wars franchise after all this time and perform with Mark, and also who came up with the page turner line? That was perfect! Frank Oz –Hey Vancouver, Thanks for writing in. It was a joy and a challenge to come back to perform Yoda. As for Mark, I’ll say it over and over if it wasn’t for Mark, and his belief in the character, Yoda would not be the Yoda we know. I think Mark did a fantastic job in THE LAST JEDI. As for the pager-turner line, that was Rian, the director and writer. All the dialogue came from him. He is annoyingly talented. Q – Hi Frank! Washington Post here, currently freezing in D.C. Thanks for doing this. Here’s a softball snowball question. In your opinion: Practical effects puppet Yoda or digitized acrobatic flippy floppy Yoda, and why? FO –Hey Post, It all depends on story. In George’s story in one of the movies the writer wrote that Yoda would have a huge fight. There was no other choice but to do CG at that point because it couldn’t be done any other way. And we’re all slaves to the story. So it all depends on story, which type of character is used, CG or real. Q – Hi Frank! I’m in Portland (the Oregon one, slightly less frozen here). Whether it’s part of performing or not, what’s a small/simple thing that gives you joy? FO –Hi Portland. What gives me joy in the large picture is making things come alive — that could be puppets, that could be scenes, that could be moments, that could be when talking to someone in real life. And the more down to earth answer is being with my wife, spending time with my wife and knowing that my kids are healthy and can manage their lives. Q – What was it like working with Alan Tudyk on Death at a Funeral? I love his performance in that film. FO –Alan Tudyk. Alan Tudyk. Alan Tudyk. What can I say about Alan Tudyk because I have so much to say? So let’s just say this. He’s absolutely brilliant and I love him. Q – Has there been any work that was particularly emotional for you, or really changed you as a person? FO –I think the answer to your question is that it wasn’t a particular piece of work, but it was the years of working with Jim Henson that changed me. His was an open, trusting, collaborative and supportive way of life, and that affected me deeply. Q – Hello Frank! Dwayne from Kingsport Tennessee here. Lifelong fan and I just want to Thank you for helping make the Muppets such a huge part of my life. I have heard you talk about the direction the Muppets have gone in recent projects. My question is what do you think Disney and the Muppets need to do now going forward? They have had a movie and a TV show be unsuccessful and I wonder is it because they are truly a thing of the past or do they just need to move in a different direction? FO –Hey Tennessee, I believe Disney really loves the Muppets and they really want to do their best for them. But my answer is not to go in a different direction for them, my answer is to get deeper into the purity of the characters. And that can be done by getting Bill Barretta and Dave Goelz and other performers who know the characters very well. It’s the purity of the characters, the purity of intent that connects with people in my opinion. Q – After his identity reveal in Empire, Yoda spoke about half of his lines using perfect language mechanics, but even the ‘backwards’ lines seamlessly blended in and served the character well. In every screen appearance since, nearly all of Yoda’s lines are intentionally and distractingly written ‘backwards.’ Were you ever concerned that Yoda became a parody of himself, or did you welcome this deliberate ‘backwards’ direction with nearly all of his dialogue? FO –I would get bored of what you called his backward talking if there was not a real, serious reason behind it. And there is a real, serious reason for his talking like that. But there are a lot of questions waiting. I’ll probably answer that at www.FrankOz.com when the time comes. Q – Do you ever find yourself applying the wisdom of Master Yoda to your own life? FO –Hi Florida, Thanks for chiming in. I’m very lucky that I have amazing writers from George and Larry all the way to Rian. They write those amazing words. And “We are what they grow beyond” — I knew when I first read it was a rich thought. I don’t associate myself with Yoda’s wisdom. My life experiences have created different wisdom in me. But I love what Yoda says. Q – A question from Florida, Like Mark Hamill, did you agree/disagree with the way your character was used in The Last Jedi? FO –Hi Florida, For me it was not a matter of agreeing or disagreeing, it was a matter of did I feel that the writing was true for Yoda. Q – You’ve recently joined Twitter, what do you think? FO –Twitter. Yes I did recently join. Please help me. I am spending far too much time. How do people do this? I’ve got to pull back, although it makes me feel bad if I do because I like answering people’s questions so maybe I’ll just pull back a little bit…but I didn’t realize that the joy of Twitter for me would be having a way to express myself personally to fans. I love that part. Be sure to visit FrankOz.com and sign up for updates.